This Princess diamond is 0.3 carat in weight, and comes with Excellent polish and Good symmetry, as verified from an independent gemological laboratory. The diamond is graded E in colour, and has a clarity grade of VVS2. The diamond's GIA grading report number is 2161279241, which will detail further its specifications and measurements, and will also come with the purchase of the stone. AUD 3,235 Excl. Duties / Taxes. This Princess diamond is 0.7 carat in weight, and comes with Excellent polish and Good symmetry, as verified from an independent gemological laboratory. The diamond is graded E in colour, and has a clarity grade of VVS2. The diamond's GIA grading report number is 1297955935, which will detail further its specifications and measurements, and will also come with the purchase of the stone. AUD 3,642 Excl. Duties / Taxes. This Princess diamond is 0.75 carat in weight, and comes with Very Good polish and Very Good symmetry, as verified from an independent gemological laboratory. The diamond is graded E in colour, and has a clarity grade of SI1. The diamond's GIA grading report number is 2175783894, which will detail further its specifications and measurements, and will also come with the purchase of the stone. AUD 25,962 Excl. Duties / Taxes. This Princess diamond is 1.8 carat in weight, and comes with Good polish and Good symmetry, as verified from an independent gemological laboratory. The diamond is graded E in colour, and has a clarity grade of VS2. The diamond's GIA grading report number is 5151263874, which will detail further its specifications and measurements, and will also come with the purchase of the stone. AUD 24,670 Excl. Duties / Taxes. This Princess diamond is 2.02 carat in weight, and comes with Very Good polish and Very Good symmetry, as verified from an independent gemological laboratory. The diamond is graded E in colour, and has a clarity grade of SI1. The diamond's GIA grading report number is 6117636634, which will detail further its specifications and measurements, and will also come with the purchase of the stone. This Princess diamond is 1.51 carat in weight, and comes with Very Good polish and Good symmetry, as verified from an independent gemological laboratory. The diamond is graded E in colour, and has a clarity grade of SI1. The diamond's GIA grading report number is 1136223990, which will detail further its specifications and measurements, and will also come with the purchase of the stone. AUD 6,758 Excl. Duties / Taxes. 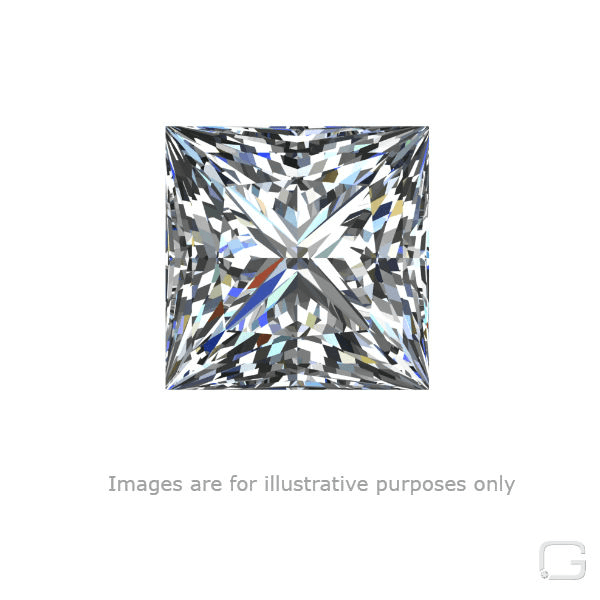 This Princess diamond is 1.01 carat in weight, and comes with Excellent polish and Good symmetry, as verified from an independent gemological laboratory. The diamond is graded E in colour, and has a clarity grade of VS2. The diamond's GIA grading report number is 1182166320, which will detail further its specifications and measurements, and will also come with the purchase of the stone. AUD 2,379 Excl. Duties / Taxes. This Princess diamond is 0.57 carat in weight, and comes with Good polish and Very Good symmetry, as verified from an independent gemological laboratory. The diamond is graded E in colour, and has a clarity grade of VS2. The diamond's GIA grading report number is 1119196698, which will detail further its specifications and measurements, and will also come with the purchase of the stone. This Princess diamond is 0.41 carat in weight, and comes with Very Good polish and Very Good symmetry, as verified from an independent gemological laboratory. The diamond is graded E in colour, and has a clarity grade of SI2. The diamond's HRD grading report number is 190000005079, which will detail further its specifications and measurements, and will also come with the purchase of the stone. AUD 1,912 Excl. Duties / Taxes. This Princess diamond is 0.51 carat in weight, and comes with Very Good polish and Good symmetry, as verified from an independent gemological laboratory. The diamond is graded E in colour, and has a clarity grade of VS1. The diamond's GIA grading report number is 2181100846, which will detail further its specifications and measurements, and will also come with the purchase of the stone. AUD 1,02,782 Excl. Duties / Taxes. This Princess diamond is 5.01 carat in weight, and comes with Very Good polish and Very Good symmetry, as verified from an independent gemological laboratory. The diamond is graded E in colour, and has a clarity grade of SI1. The diamond's GIA grading report number is 2294996981, which will detail further its specifications and measurements, and will also come with the purchase of the stone. AUD 4,893 Excl. Duties / Taxes. This Princess diamond is 1.01 carat in weight, and comes with Very Good polish and Very Good symmetry, as verified from an independent gemological laboratory. The diamond is graded E in colour, and has a clarity grade of SI2. The diamond's GIA grading report number is 2276441206, which will detail further its specifications and measurements, and will also come with the purchase of the stone. This Princess diamond is 1.01 carat in weight, and comes with Excellent polish and Very Good symmetry, as verified from an independent gemological laboratory. The diamond is graded E in colour, and has a clarity grade of SI2. The diamond's GIA grading report number is 6301194743, which will detail further its specifications and measurements, and will also come with the purchase of the stone.